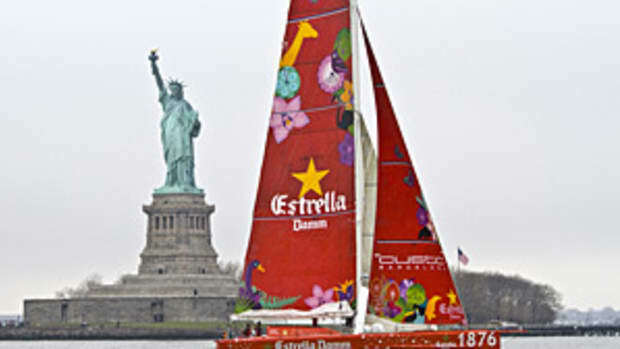 Rambler 100, skippered by George David of Hartford, Conn., crossed the finish line of the Transatlantic Race 2011 on Sunday with an elapsed time of 6 days, 22 hours, 8 minutes and 2 seconds. It has established a new record for the 2,975 nautical mile course from Newport, R.I. to Lizard Point, South Cornwall, U.K., which is to be ratified by the World Sailing Speed Record Council. "For the first 80 hours of this race we were ripping along; towards the end we hit a few holes in the wind, but the net speed average was 15.7 knots across the Atlantic, which I think is going to prove a record in its own right – as a speed record for any trans-Atlantic race. We feel pretty good about that,” David said on the docks. Click here for the official race site.